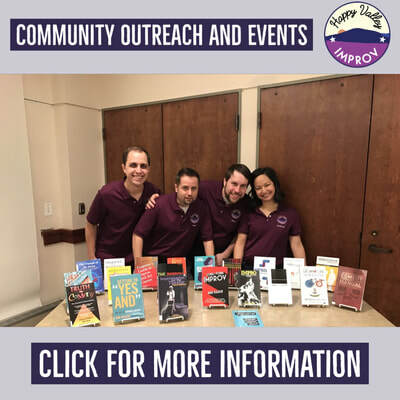 Whether it's for a corporate workshop, a private show, or a community event, Happy Valley Improv will bring a fun and supportive experience. 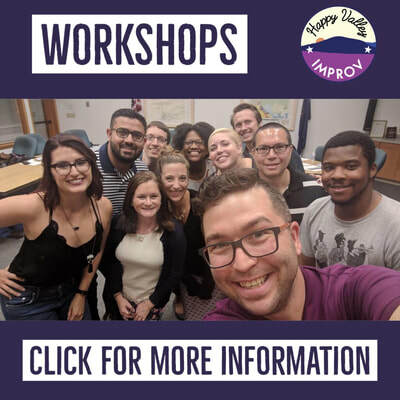 Happy Valley Improv offers workshops for professional development and team-building for businesses, schools, universities, non-profit organizations, and more! For more information on our work with improv and teaching, or to book a pedagogy-focused workshop, visit our Improv and Pedagogy page. Looking for some entertainment for a holiday party? Sick of booking the same old bands for your company's corporate retreat? Have a cool event or festival that you need some entertainment for? We've got you covered! Happy Valley Improv can provide fun, engaging, and hilarious entertainment for whatever your event may be. We can tailor our performance length and style to your needs! Happy Valley Improv's mission is to "bring the art of long-form improvisation to State College through performances, workshops, classes, and community outreach." We are dedicated to the betterment of the State College community through the art of improvisation. If you are a community-oriented non-profit who serves the greater State College area, we would be happy to work with you. We offer reduced rates for community events and sometimes will donate our time. We also designate certain shows as "Fundraiser Shows," where we donate proceeds to a local charitable organization. Leadership Centre County "Arts Day"
We are also heavily involved in local arts events, such as First Night State College and the Central PA Theatre and Dance Festival. If you are interested in booking us to work with your organization, or to take part in a local arts event, please fill out the form below! If you're interested in what we have to offer, please fill out the form below! We will review your submission and get in contact about details and pricing. You can also email us at happyvalleyimprov@gmail.com or call us at (814) 954-0053. Business/Organization Workshop Private Show Non-profit/Community Outreach Community Arts Event Other (please explain under "Anything else you would like us to know?"